The moral of the story behind Rudolph is that no matter how different you are from others, you are always special in your own way! Robert May had written this tale in 1939 and our favourite Reindeer has since then became a classic figure of Christmas folklore. I’ve always loved Rudolph because he is a wonderful reminder that we can always find strength in our uniqueness. Another reason is that Rudolph is family to me! For many who do not know, my middle name is Fawn! Yes, I’m a baby deer. Oh yes, and Rudolph may actually be FEMALE. That’s right! Only female reindeers retain their antlers during Christmas while male reindeers would have shed their antlers by then. Male reindeers use their antlers to fight during their mating season in autumn and discard them after to conserve energy for the winter. In the case of female reindeers, they use their antlers during the cold season to dig through snow and shed them by springtime. It is interesting to discover that both sexes have different antler cycles! Preheat oven to 350 degrees F and line 12 muffin cups with paper liners. Evenly fill the muffin cups with the batter and bake for about 17 – 20 minutes or just until set and a toothpick inserted into a cupcake comes out clean. (Always check a few minutes before the stated baking time. Do not over bake or the cupcakes will be dry.) Remove from oven and place on a wire rack to cool. Can you name the other 8 reindeers?? They are.… Dasher, Dancer, Prancer, Vixen, Comet, Cupid, Donder and Blitzen! 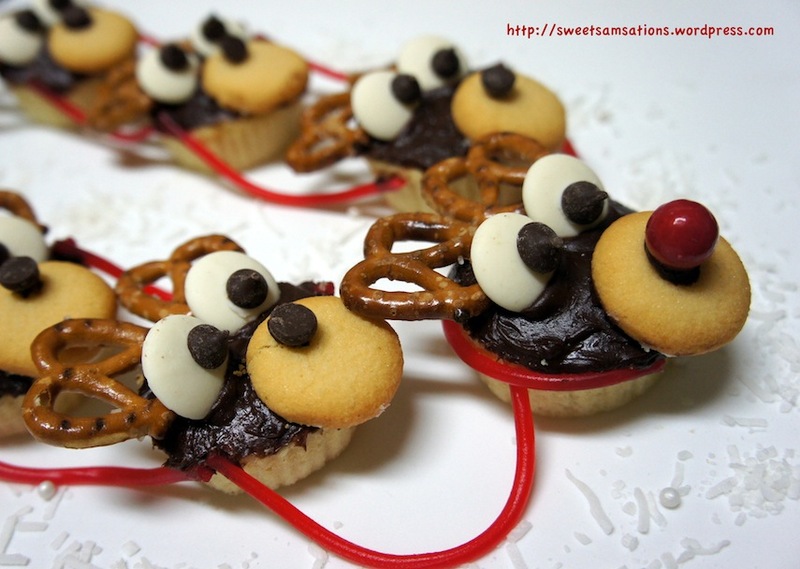 As you can see I only made 7 though.. tee-hee..
Sleigh: Use red licorice fastened with frosting to connect each reindeer as shown in picture. I find it such a beautiful Christmas message to share with others. Remember that we can always find strength in our differences! Merry Christmas to each and every one of you! Cheers!! My Gosh! These are ADORABLE! Love the Rudolph story. Merry Christmas! These are really cute, Merry Christmas to you and your Family! These are too pretty!!! Wouldn’t stop me from eating them up though. Great job! Lol.. I always feel bad eating my cupcakes when they have a face on them but I do it anyway 😀 Happy Holidays Tiaaa!! O my goodness these are so adorable!! Seriously what a creative idea and that movie is my all time favorite too :). Hope your Christmas was wonderful. Happy Holidays! Thanks Suzanne! I know! I can’t imagine anyone not loving Rudolph! Same to you!! OMG, these are SO cute. 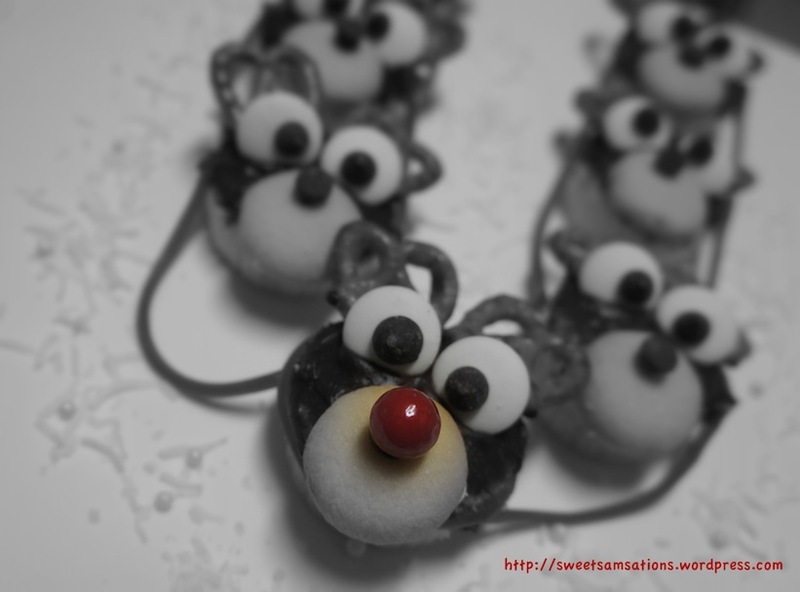 Yes, I think I can eat Rudolph ;D Hope you’ve had a happy holdday thus far!! Thank you Lisa! Hope you have a wonderful one too! I felt a little cannibalistic eating him but oh wells! He tasted pretty good! 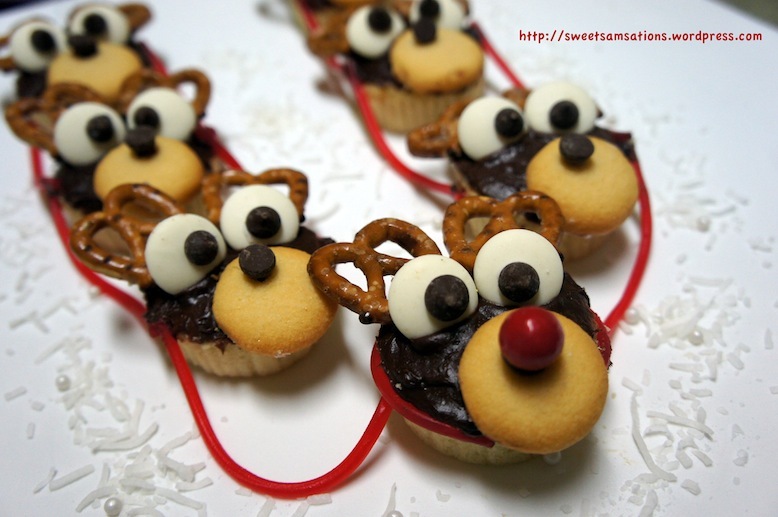 These are just too adorable and perfect for the Christmas season- I certainly wouldn’t bear to eat them! tee hee.. I knowww!! I was a little sad I was eating my poor Reindeers too especially when they were staring at me with their googley eyes. lol! ps: didn’t know there were 8 reindeers and they have names! These were too cute. I almost felt bad gobbling poor Rudolph…..